Christmas. Tinsel. Santa Claus. Gift giving. Egg nog. Trees adorned with ornaments. Family gatherings. Office parties. A shadowy killer in a hooded rain slicker on a psychotic murder rampage? *Now* we're talking. Originally aired on November 28, 1972, Home For the Holidays is an Aaron Spelling/Leonard Goldberg co-production directed by TV horror guru John Llewellyn Moxey and bolstered by a Joseph Stefano script (he of PSYCHO fame). With such considerable steam behind it, no surprise this Made-for-TV yuletide thriller is one that should not be missed. 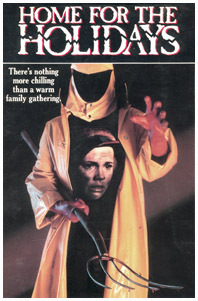 1974's Black Christmas receives a lot of attention (and deservedly so) but this 1972 teleslasher runs a close second in an unfortunately small subgenre of seasonal horror offerings; others include Christmas Evil and To All a Goodnight (both 1980) and of course 1984's parental fave Silent Night, Deadly Night. Benjamin Morgan (Walter Brennan), an ailing patriarch, has summoned his four estranged daughters to his home for Christmas to mend fences. Alex (Eleanor Parker) is the first to arrive and after decorating the tree, she heads to the airport to pick up the others as a heavy rainstorm falls. On the way, she chats briefly with Dr. Ted Lindsay (John Fink), one of the locals. The Morgan sisters are not especially happy to spend the holiday with their dad, whom some blame for the suicide death of their mother. The siblings include Joanna (Jill Haworth), Frederica (Jessica Walter) and Christine (Sally Field), the youngest. They find out that their father is dying and soon hear another shocker. Alex shows them a note from him that claims he is slowly being poisoned by his new wife Elizabeth (Julie Harris). Inside the house, the sisters get a first glimpse of their stepmother at the top of the staircase. It's a less than friendly meeting - as Elizabeth and her stepdaughters are wary of each other. Frederica (who has taken to heavy drinking after her mom's death) notes sadly, "When I think about her sleeping in the same bed mother died in..."
A visit with their father doesn't go much better. With the exception of Christine, the most sensitive of the bunch, Benjamin is downright hostile to the others. Although he doesn't want the sheriff involved, he needs their help and reminds his daughters that Elizabeth was suspected of murdering her first husband. Perhaps they can kill HER, he tells them. That night, Frederica is depressed thinking about her mother. Christine listens as her older sister prattles on about their father's culpability in the matter...and how he was seeing Elizabeth while still married. Frederica becomes too inebriated to come down for Christmas Eve supper. During the meal, Elizabeth tells the siblings that Benjamin refuses to see Dr. Lindsay. And the Morgan girls use the occasion to grill their stepmother about the death (by poisoning) of her previous husband. Although she was cleared by a grand jury, Elizabeth's life was turned upside down. She recalls how the people in the town never let her forget what happened - and how she eventually woke up screaming in an asylum. And then she startles the sisters by saying, "I will tell you this...if a nightmare like that should ever happen again...if for some reason I'm ever accused by anyone of killing...the next time, I will not be the one who wakes up screaming." As if on cue, Frederica's shrieking can be heard coming from the sewing room. The group rushes upstairs to find her distraught...having cut herself with a piece of glass and weeping over a painting of her mother. She appears to be losing her mind. Joanna decides she cannot stay any longer. Despite a plea from Alex to stick around and help their father, Joanna does not believe that Elizabeth is plotting to kill him and feels they were tricked into coming for some reason. After all, the four sisters are in his will and the past is forgiven...which means Elizabeth will not inherit the entire estate. Joanna asks Alex if she can borrow her car so she can drive out to the train station. After attempting to say goodbye to Frederica (who doesn't respond), Joanna walks out into the storm towards the vehicle and is promptly killed with a pitchfork by someone wearing a rain slicker, red boots and rubber gloves. She is brutally stabbed in the back and her body is then dragged away. Christmas arrives and Christine gets an unexpected visitor. Dr. Lindsay stops by and gives her a gift: a pendant. He tells her that Elizabeth had asked him to see Benjamin the month before...because the old man had accused her of poisoning him. This strikes Christine as odd. Why would Elizabeth do that if it were true? She must be innocent...or very clever. Alex informs her youngest sister that she's going to ask their stepmother to leave the next day. And the phone line is dead...perhaps due to the ferocious storm that continues to batter the area. By nightfall, Frederica is once again in a drunken stupor. While taking a bath with drink in hand, she is pulled underneath the water by the killer and drowned. Christine finds the body and it appears to be a suicide or an accident. Alex pushes the notion to her father and Christine that Elizabeth murdered Frederica by putting something lethal in a hot milk and honey concoction that she had been given. Elizabeth denies that Frederica had even touched it. With the roads washed out, Christine attempts to walk a mile in the woods towards the nearest neighbor's house to get to a phone that works. She suspects she is being followed and sure enough, a person wearing the yellow rain slicker and brandishing a pitchfork is on her tail. When she returns to the Morgan home, Christine makes a grisly discovery. She finds Joanna's corpse behind the barn partially buried under some mud. She screams and when she sees Elizabeth nearby, she runs towards the house. Christine sees that her father has died and tries to escape from Elizabeth...the woman she is convinced is doing the killing. As Christine runs to the road looking for help, Alex pulls up in her car. To Christine's astonishment, her sister admits to the murders. Alex knocks Christine down a hillside to (what she believes) is the girl's certain death. Dr. Lindsay happens to be driving by and Alex tells him that Elizabeth is responsible for what has happened. The next morning, Alex accompanies Sheriff Nolan (Med Flory) to the Morgan estate. When told that Christine's body has been put in one of the bedrooms, she enters it and pretends to be devastated. But her satisfaction at having blamed the entire affair on Elizabeth is shattered when Christine opens her eyes. The young girl is most definitely alive and the police now know the truth. Alex is arrested and Dr. Lindsay takes Christine away to begin a new life. Elizabeth, no longer under a cloud of suspicion and a widow once again, is left alone in the Morgan house. Home For the Holidays is a classy production all the way...from its casting of Walter Brennan, Julie Harris and Eleanor Parker...to a truly elegant and wistful score by George Aliceson Tipton. In a wonderfully controlled performance, the Harris injects Home with an effective air of ambiguous tension. Is she the mad hatter or not? In the type of 'suspected killer' role so prevalent with gialli from the '70s (and to a slightly lesser extent slashers from the '80s), Harris is fresh, dark and commanding as Elizabeth. As with 1963's The Haunting, she's an invaluable cornerstone here. The vital element in Home would undoubtedly be Parker (everyone's favorite Baroness spurner from 1965's The Sound of Music). In one of her few sojourns into horror (another would be 1979's She's Dressed to Kill), Parker clearly relishes the role of big sis Alex...everyone's rock of emotional support that unfortunately won't prove to be Gibraltar. For Brennan, who had been in the business since 1925, this would be one of his last roles. The beloved actor died in 1974 of emphysema. Fresh-faced Sally Field is wonderful in a transitional role between the Gidget and Flying Nun comedy programs...and her breakthrough Emmy-winning 1976 turn in Sybil. And Jessica Walter (just a little bit underused here) nicely reprises some of her Play Misty For Me insanity. Nobody does unbridled crazy like Jessica. Pretty Brit Jill Haworth had become something of a minor scream queen by this period in her career with roles in It! (1966), Haunted House of Horror (1969) and 1972's Tower of Evil. Director John Llewellyn Moxey, who had helmed many a stellar TV production, including The House That Would Not Die (1970), A Taste of Evil (1971) and The Night Stalker (1972), was well on his way to a prolific career in thrillers made for the small screen. Among Moxey's other works are Nightmare In Badham County (1976), and No Place To Hide and Killjoy (both 1981).